October is here and you can finally break out the Halloween decorations, pumpkin carving kits and take the kids to your local corn maze! The leaves are just now starting to fall and you can tell that a change in weather is coming very soon! I have not found many people that don’t like the month of October, but when I do, its usually because of all the changing that occurs. Change can be difficult to say the least and even if its a change that comes every year, it can still be hard to adapt to. So, to soften the blow of this new month, lets discuss some change that takes no getting used to! The change I am speaking of is change in price and your fortune! You can never go wrong when the arrow button on pricing is pressed in the downwardly direction and that is exactly what we have done. Through the month of October, Mission Repair will be running multiple specials and slashing many prices! Lets start off with what we already have in place. Price slashed on our iPod Touch 4 Screen Repair Service! We have lowered this price by $30.00 to a lowly $59.00 and that price is here to stay! Our “Deal Of The Month” in October will have you saving an extra $10.00 off your much needed iPhone 4 and 4S screen repair services! Prices lowered on our Amazon Kindle 2 Screen repair service so you can keep your books with you at all times! Prices lowered on our Amazon Kindle 3 Screen repair service as well! 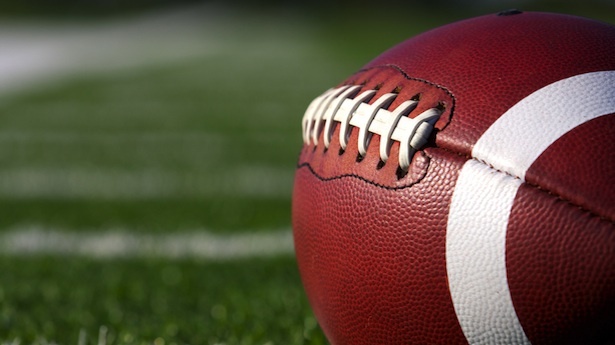 Our “When Kansas City scores, you score” promotion will be running for the entire NFL season, so keep track of the Kansas City Chiefs games and save some cash when they score a touchdown! This is just a tiny portion of what you will see this coming month, so stay tuned and involved and you just might learn a thing or two , save some serious money and win some cool prizes along the way! Speaking of prizes, Mission Repair has recently run a giveaway on our Facebook page and we have a winner! Look for a post coming soon announcing the winner and an announcement of our next awesome giveaway! I have been unable to hide my excitement around the office for the last couple of days! This happens around the end of August each year. The weather becomes mild, the people of the world become a little nicer and something we in America like to call FOOTBALL, comes back to life! This is an awesome time of the year for us because we have just signed up for a huge campaign of advertising which will be focusing on the Kansas City Chiefs Pre Game show. In fact, we have several campaigns running now, but the best part is that there are several new commercials being produced as we speak. This means that the fun is about to begin with new creative coming to a television near you! Now this brings a whole new spin to our fandom. We now have a business relationship with the professional football team that we have both cheered for and rooted against for years. It should be an interesting season to say the least. 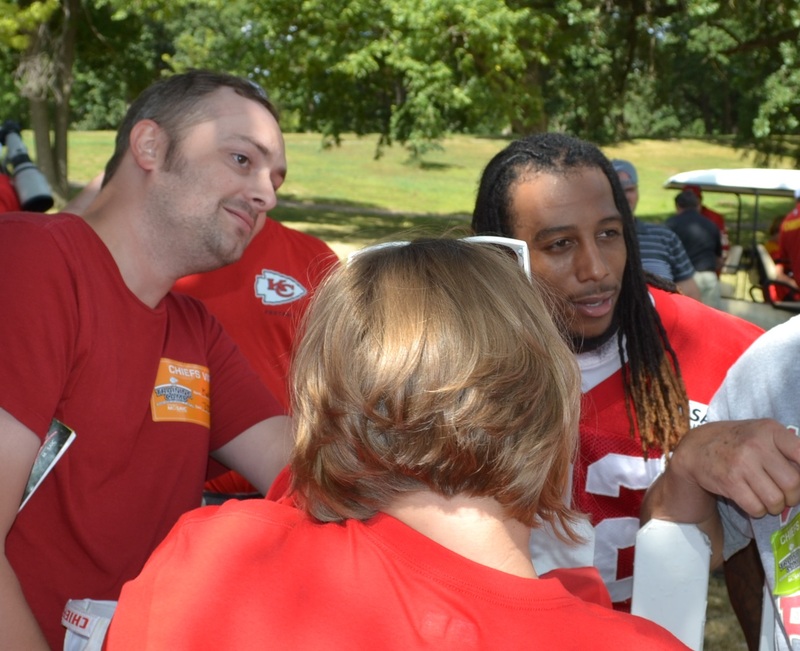 Mission Repair partners with many different people and organizations throughout the year, and one of our favorites is the Kansas City Chiefs. On Saturday, we were invited to their training camp and received a VIP treatment! Here are a few pictures from the event! 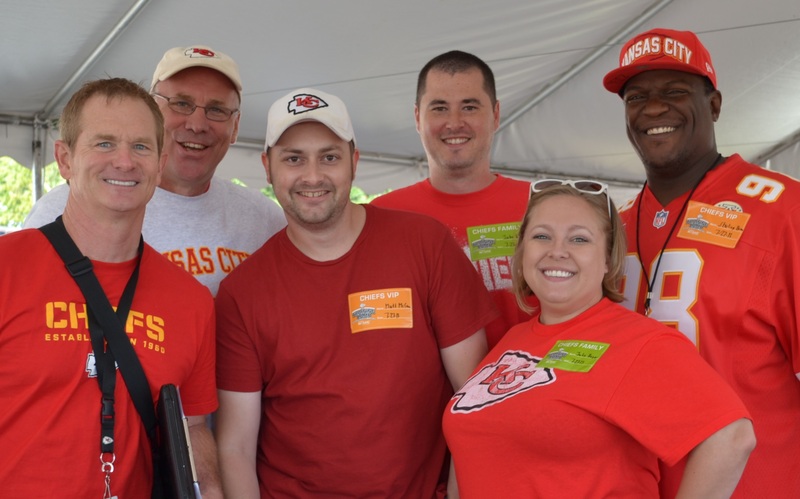 Chiefs GM John Dorsey, Mitch Holthus and the Mission Repair gang! Our super technician Matt and his good friend Dexter McCluster! Jake and Matt wishing they never quit football in high school. “Do you ever wish you could just go back” Says, Jake. It was a beautiful day and we throughly enjoyed watching what is sure to be a playoff contender, practice for a few hours! We enjoyed some great food, drinks and most of all company as you can see in the above pictures. Do you see Matt there challenging Dexter McCluster to an iPhone repair competition? Well, Dexter came back with a foot race challenge and that pretty much shut Matt down :-). 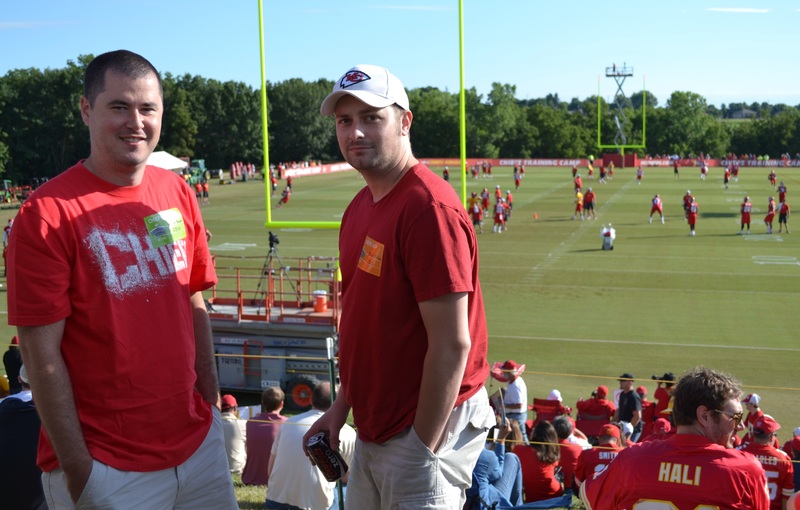 We have many cool Chiefs events planned and can’t wait for this coming season! So watch out and listen for Mission Repair at a Chiefs game near you! Are these the hands of an iPhone technician? This weekend I was hanging around the house watching some football- what a weekend of football it was! My goodness there are teams that I think are good then just prove they are not. Then there are teams that are bad, and continue to be bad. I guess it’s the way football goes. You just never know! Anyway. 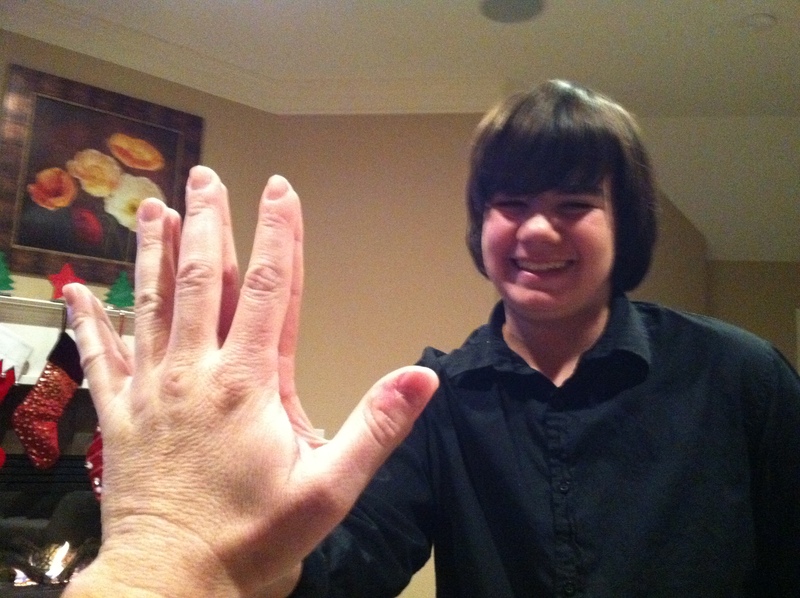 . .
My son Casey was hanging out on the couch with me (we got some good “couch time” together!) and I noticed his hands. . .
OK, moving on to business. . .look for us in the news. This week will mark some huge press for Mission Repair. Let me know what you think and keep your eyes open. Happy Holidays!